We store about 25 Wall of Water individual plant greenhouses in a single 5 gallon bucket – that’s enough to shelter hundreds of pounds of tomatoes. What Is Wall O Water? Wall O Water is a water-filled cone or cylinder shaped greenhouse that can be set up around a plant in a matter of minutes. It lets you add a warm, moist micro-climate anywhere you need one and protects your plants down to 16 degrees, so you can get a jump on the season. I’ve described our experiences with Wall O Water at length on another site, GreenhouseFarming.net. 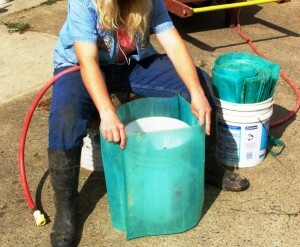 Here I’m going to describe how we use 5 gallon buckets alongside our Walls O Water. 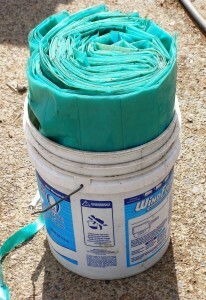 We pack Walls O Water in tight – and not just so we can economize on 5 gallon buckets. It’s good to let them dry, upside down, in full sun before putting them away. We make sure to store these in a dark place when we’re not using them to protect them against UV radiation. 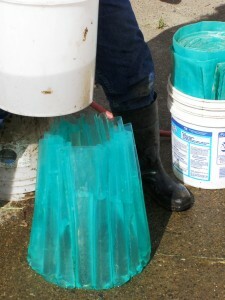 They are somewhat resistant already but give anything plastic enough sun and it will start to crumble. They’re already out in direct sun a few months a year and we don’t want them to get brittle, or they could start leaking. Because they are so flattened, it’s quite the job to fill them up again. But after ten years of practice, we’re pretty quick. 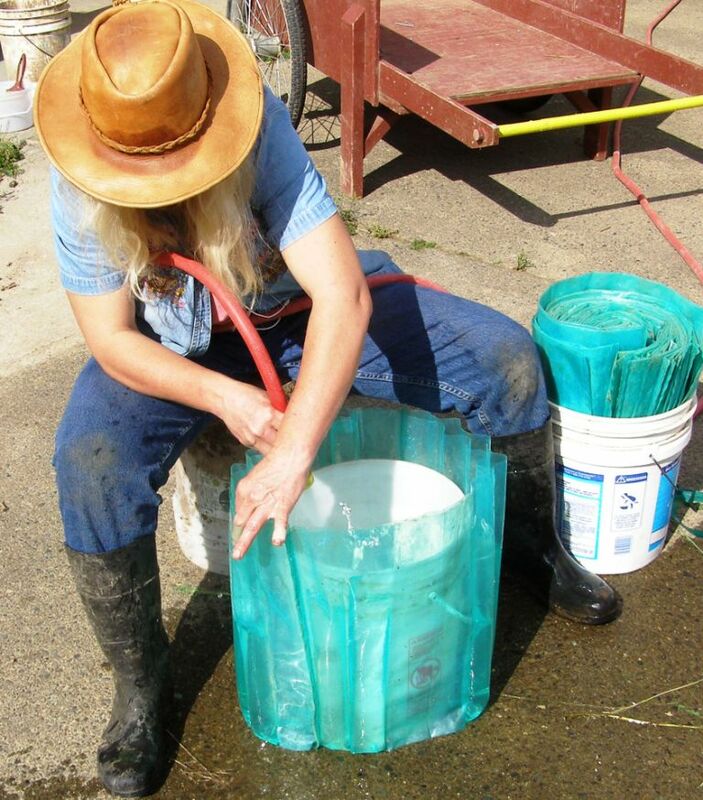 We encircle a 5 gallon bucket with the deflated Wall o’ Water, then fill each bladder up individually in a star pattern, using the bucket sides to support each bladder. 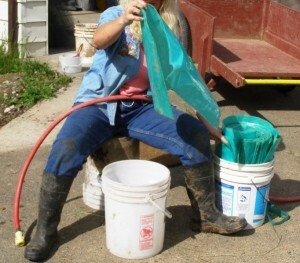 The bucket provides a convenient receptacle to catch the water as you open the next bladder. If you’re interested in finding out more about using Walls O Water to protect your plants and extend your seasons, read about them on GreenhouseFarming.net or check the reviews on Amazon. 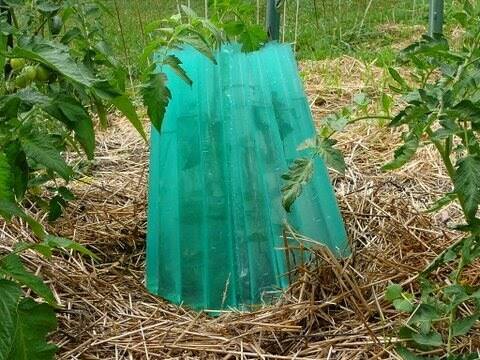 Neat but how about keeping the 5 gal bucket upside down so you can put it right over your tomato plant and then put the wall around it, fill the wall and remove the bucket and on to the next tomato to protect?